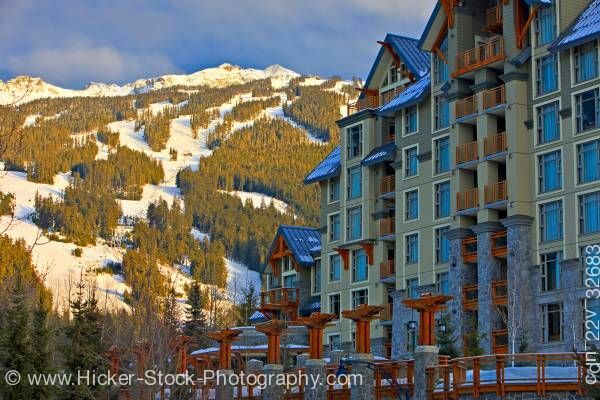 Stock photo of Blackcomb Mountain and the Pan Pacific Hotel seen from along the Village Stroll, Whistler Village, British Columbia, Canada. Blackcomb Mountain (2440 metres/8000 feet) and the Pan Pacific Hotel seen from along the Village Stroll, Whistler Village, British Columbia, Canada. Blackcomb Peak is a mountain located east of Whistler, British Columbia and forms the boundary between the Whistler Blackcomb ski resort and Garibaldi Provincial Park. Like Whistler Mountain, it is located on the edge of Garibaldi Provincial Park and the ski lifts are often used to access the park. Not only can you ski right to this hotel, but thanks to a large heated outdoor pool and Jacuzzi deck, you can sit at the end of the day sipping a glass of wine, gazing up at the snowy slopes, and marvel at the ameliorative effects of warm water on aching muscles.